FITC conjugated Mouse anti Canine CD3 and PE conjugated Rat anti Canine CD4 (DC046). All experiments performed on red cell lysed canine blood gated on mononuclear cells. 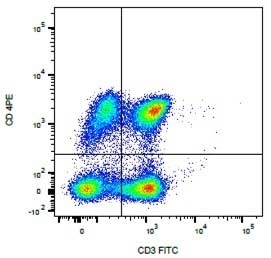 DC046 is a dual colour reagent recognising canine CD3 and CD4 cell surface antigens. Clone CA17.2A12 recognises canine CD3, a T cell differentiation antigen expressed on mature T lymphocytes. Clone YKIX 302.9 recognises canine CD4, which is expressed by lymphocyte subsets and canine neutrophils.